Der Artikel Josef Suk (1874-1935): Lebensreife op.34 wurde in den Warenkorb gelegt. Partituren uneingeschränkt gewachsen und Petrenkos Klangregie durchleuchtet Suks komplexe Tonwelt und lässt sie ebenso spannungsvoll wie bildhaft erscheinen« (klassik-heute. com 5 / 06 zu »Ein Sommermärchen« u. »Der verzauberte See«). Our third publication as part of our cycle of symphonic poems by Dvorak’s son-in-law Josef Suk is devoted initially to the overture »Märchen eines Winterabends« from Shakespeare’s piece »A Winter Tale«. 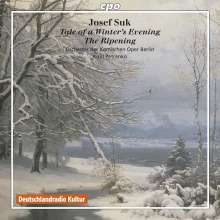 During the first few bars, however, it becomes clear that Suk has assiduously avoided the original’s aims and objectives and has conceived music which holds fast to the classical principles of sonata theory. His later sound poem »Ripening« was written between 1912 and 1917 and describes a mature artist looking back on his past life. 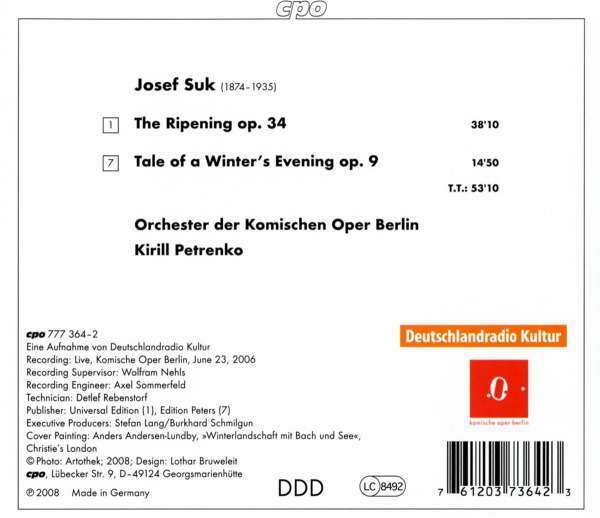 As in a burning-glass, here the outstanding artistic traits of the composer are concentrated : a dense score for large orchestra with intricate rhythms, constantly changing motif references and allusions to earlier works was the result. An impressive composition with atmospheric depth. And once again, the orchestra of the Berlin Komische Oper has shown itself «unequivocally equal to the high demands of the score and Petrenko’s direction illuminates Suk’s complex worlds of sound and makes them seem as full of suspense as they are vivid. » (klassik-heute. com 5 / 06 about »Ein Sommermärchen« and »Der verzauberte See«).